V Findlay Wolfe BLOG: Doing GOOD at QuiltCon!! "Star Power" Quilt By Victoria Findlay Wolfe, 80" x 80" 2016: Mostly Manor fabrics. Join me at the Marcus booth at QuiltCon! as we Quilt for ALS! Hey QuiltCon attendees: What could be better than free fabric attached to a worthy cause?? Check out our Charity Make-n-Take in Booth # 630 for your FREE quilt block kit — it’s your chance to join Victoria Findlay Wolfe in a bit of creativity, and to help those with ALS…We are GIVING you the Mostly Manor fabrics, at the booth at Quiltcon. ONLY these Quiltcon blocks, will be used in this particular ALS project... This is NOT an open call for random blocks to receive... 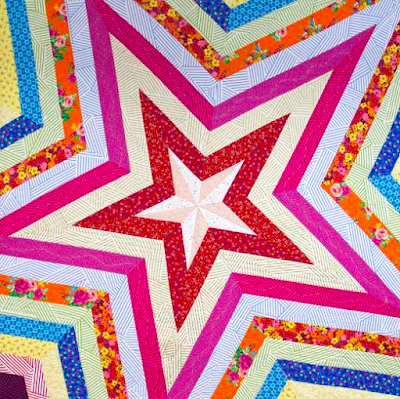 This is a Special QuiltCon project only. Be sure to also visit me at the SIZZIX and JUKI and book signing at C&T publishing booth at QuiltCon! Schedule coming shortly! Do I understand correctly that we CANNOT use other than manor fabrics? I'll I'll see you there. Also really excited because I just found out that I got into your Hex Stretch and Tumbler class off the wait list! So I get to play with you on Friday! What a fabulous idea!!! Enjoy QuiltCon! I am sad to say I am missing this one but will be following along on Instagram. Post lots of pictures!